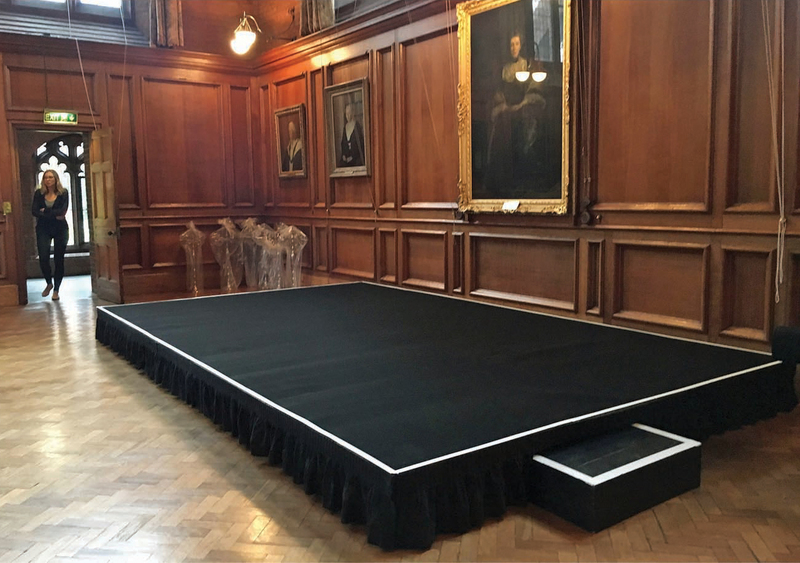 Stage Hire is becoming a popular choice as our clients understand the benefits they can add to the event. We stock 4 stages that are made of aluminium which makes them strong yet light weight vs traditional steel stages. We have four available in stock that when added together they give you a stage area of 16 x 8ft if you hired all four. Finish the look off with some carpet & runners to really make it pop! Stages are perfect for events such as Weddings, Party’s, Presentations, Conferences, Exhibitions, Seminars & Cat Walks. Hiring a stage is an easy way to make your event a total success by allowing the entertainer or speakers to be elevated enough for the guests to see & enjoy. Backdrops are a great add on to any stage hire. We can offer you white or black backdrops, twinkle backdrops, projection backdrops, fully printed back drops onto heavy canvass which all can be complimented with uplighting in the colour of your choice. We can work to your theme & include any artwork you provide to get the look you desire with the backdrops. They are usually 3m tall and 7m in length when put up & really set the scene for the day ahead. Backdrops for plain Black or White are usually around £190. Projection depends on how much editing hours are needed to get your design right but in the region of £140-290. Printed Backdrops are complete custom one offs & on canvass. The price is quoted on each individual event depending on size, number of colours & material used. If more staging is needed please enquire as this can be arranged. Why not keep in touch by adding us on Facebook & Instagram.